Sea Island villa is sheer luxury. 6 bedrooms, 6 bathrooms. 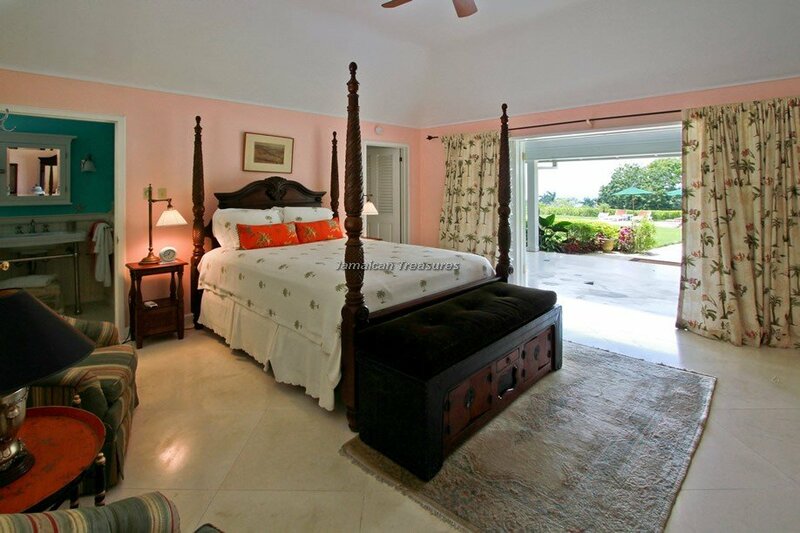 Total new renovations makes Sea Island one of the most luxurious villas in Jamaica! Sea Island Villa is a wonderful, spacious luxury villa Jamaica that sits on seven acres of hillside and rolling grounds near Montego Bay. 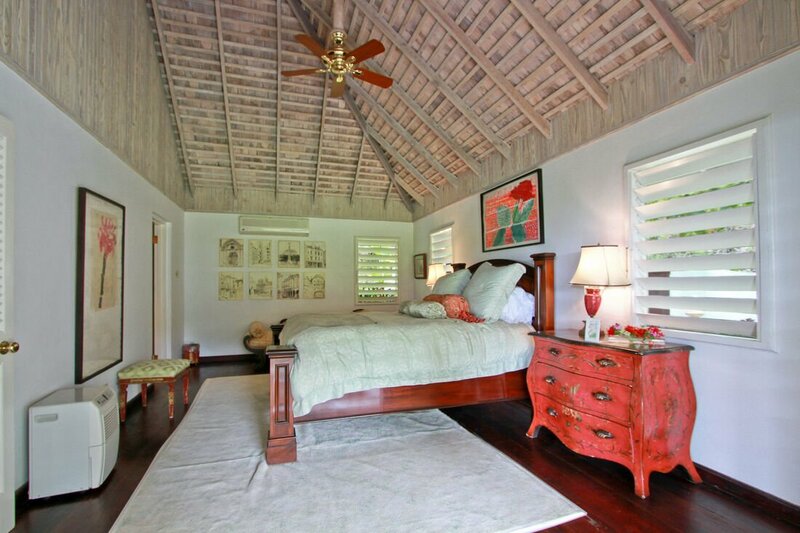 The recently renovated fabulous Jamaica villa enjoys the luxuries of a wonderful tropical home. 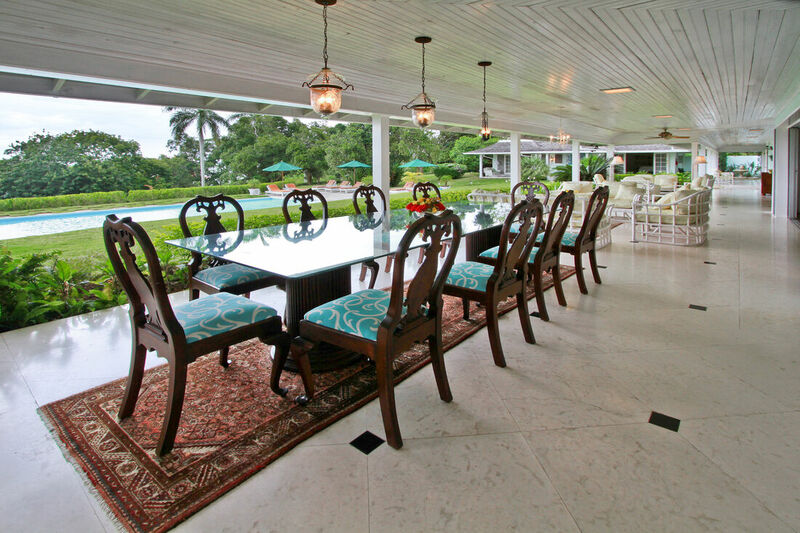 The elegant interiors feature a unique mixture of English Colonial, French and Jamaican furnishings accented by white limestone and rich mahogany floors. 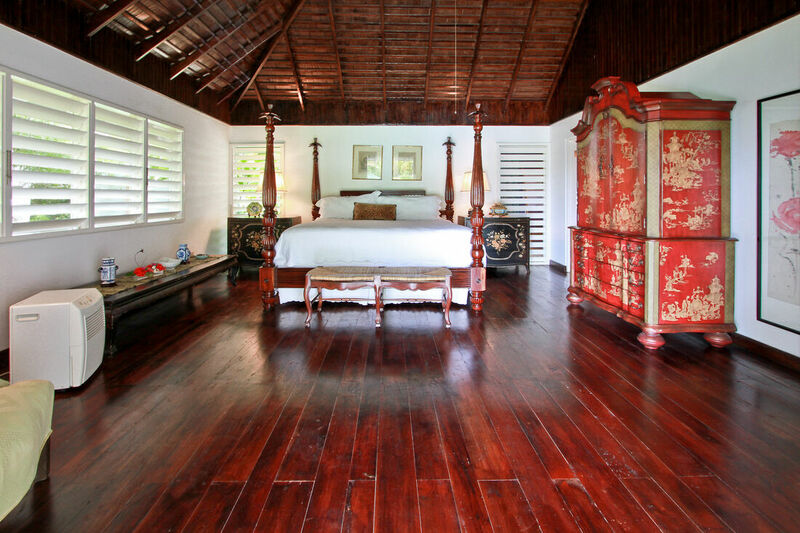 The rooms are enhanced by the arrangement of Bombay chests, Oriental and French linen rugs, and various antiques and art. The new interiors reflect the work of a professional interior designer, creating a remarkable ambiance with fabulous décor. 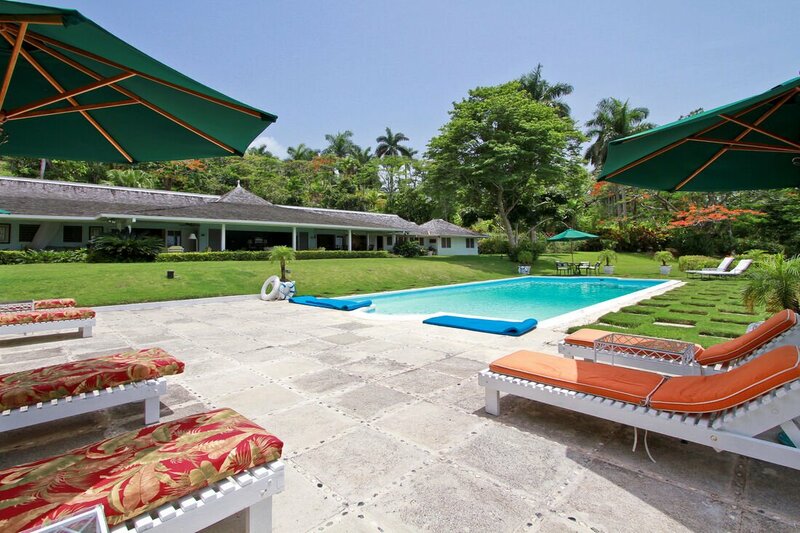 For those looking for a peaceful and elegant villa rental in Jamaica with privacy, Sea Island Villa is the one! 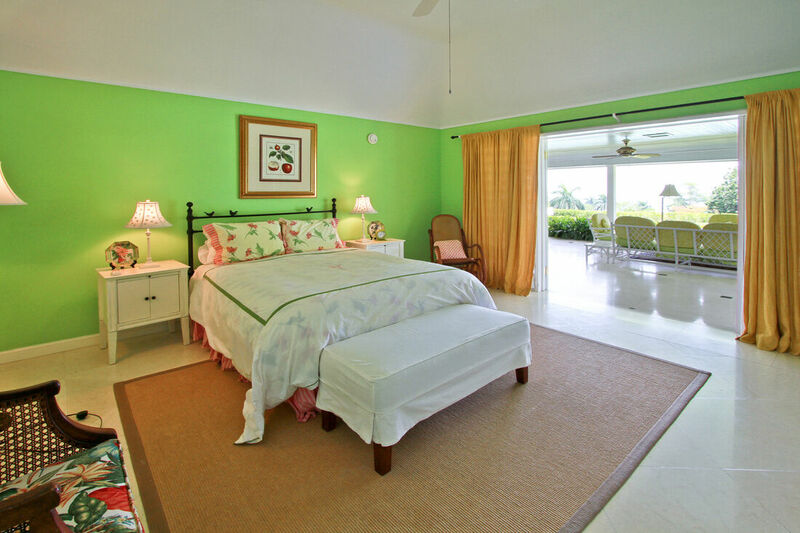 Sea Island Villa offers six tastefully furnished bedrooms with excellent soft furnishings, ample closet space, wooden flooring and tall ceilings. 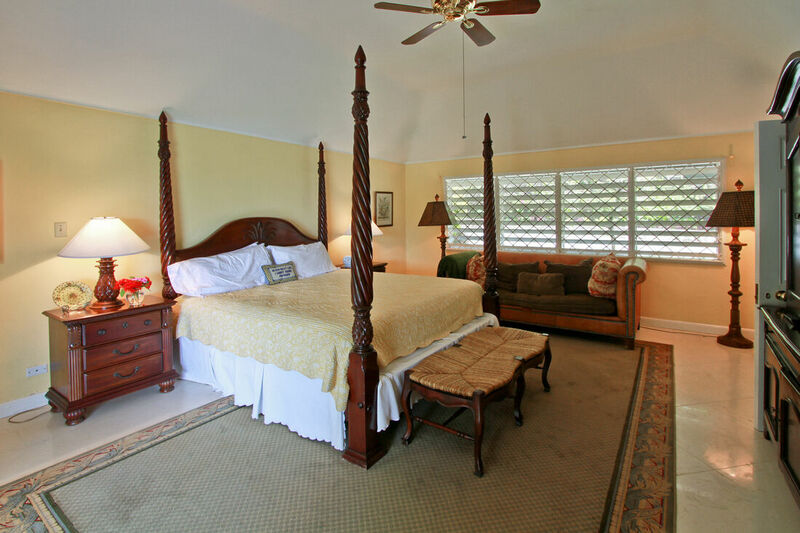 The master suite has two bedrooms, each furnished with a king-sized or queen-sized bed. 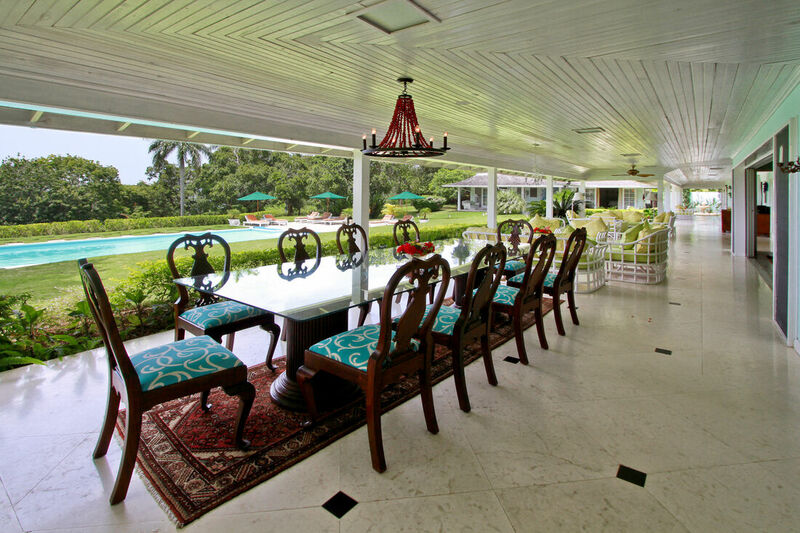 Lovely French doors open up to a marble tiled verandah with seating area. 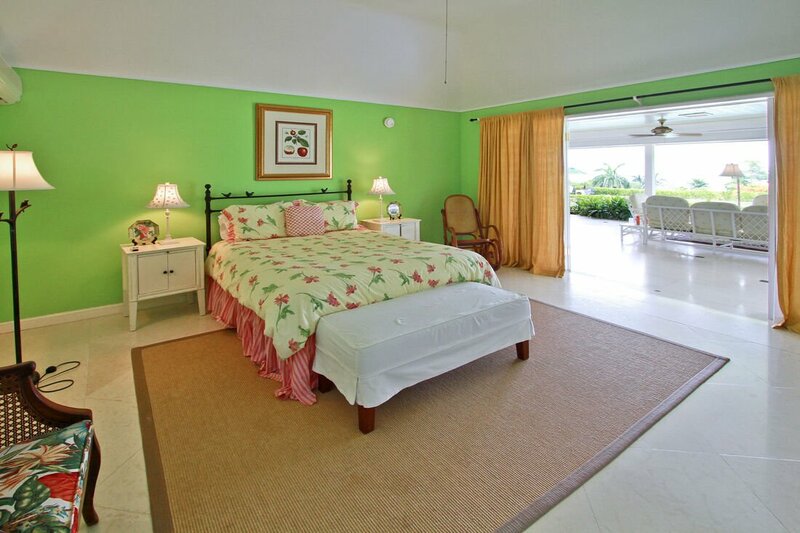 The other bedrooms include the yellow, pink, and green bedrooms that are furnished with king or queen-sized beds. 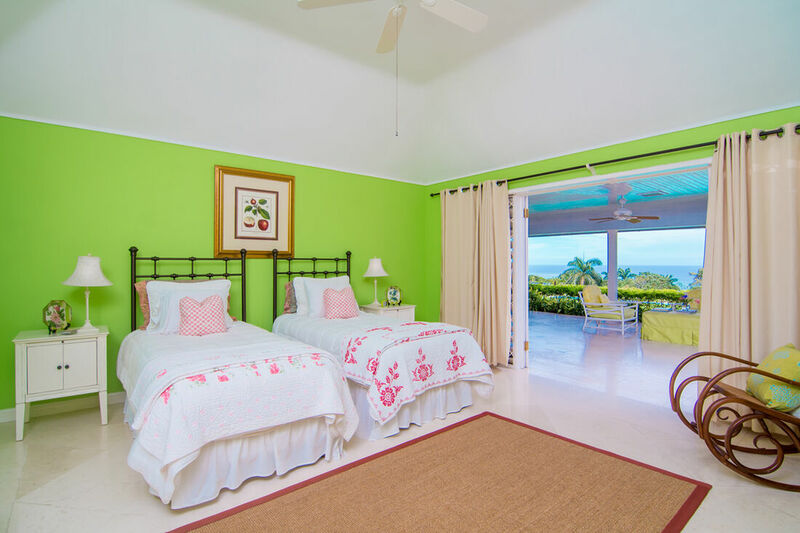 The sixth bedroom is designed specifically for kids and has two twin beds and a collection of stuffed animals and children’s toys, which can be removed for adult occupancy. 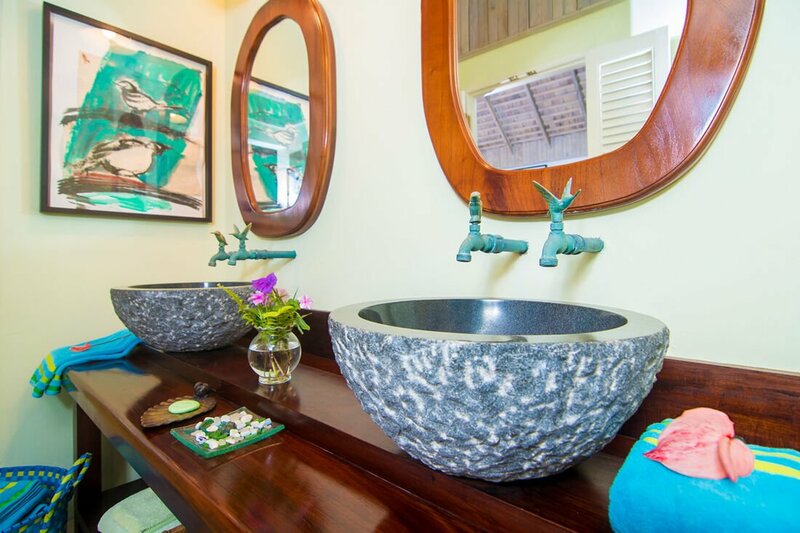 The en suite bathrooms are very luxurious with artful mosaic tile work, new sculptured modern bowl sinks and amazing light fixtures. 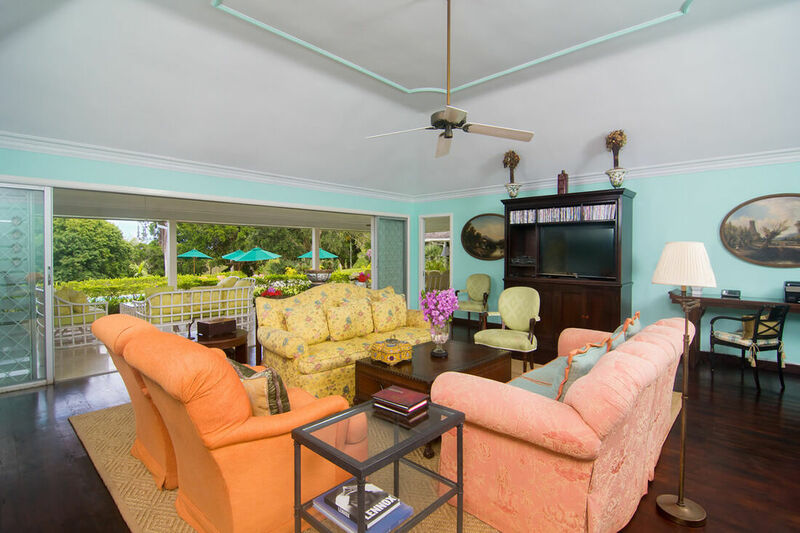 The stunning Sea Island Villa features an extra-large and very spacious L shaped veranda with a lovely fountain, exquisite garden and Italian-tiled wet bar. 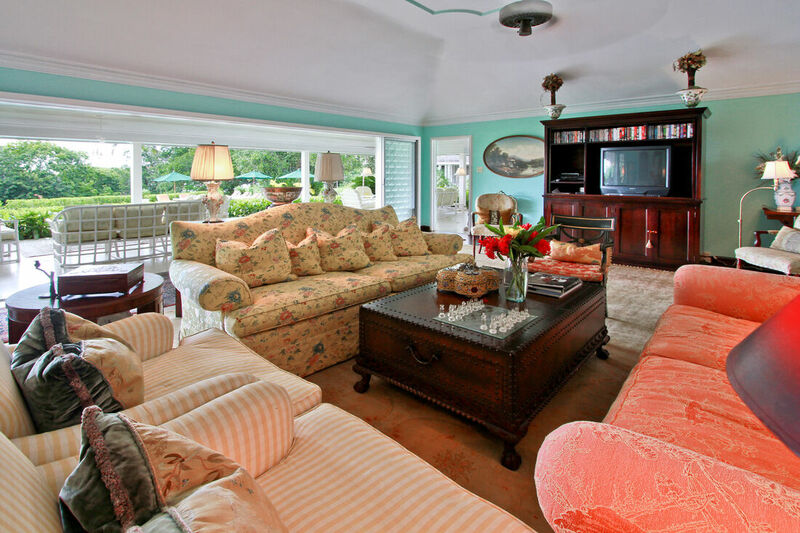 The furnishings are very comfortable with wonderful sitting areas for reading, relaxing, snoozing or entertaining. 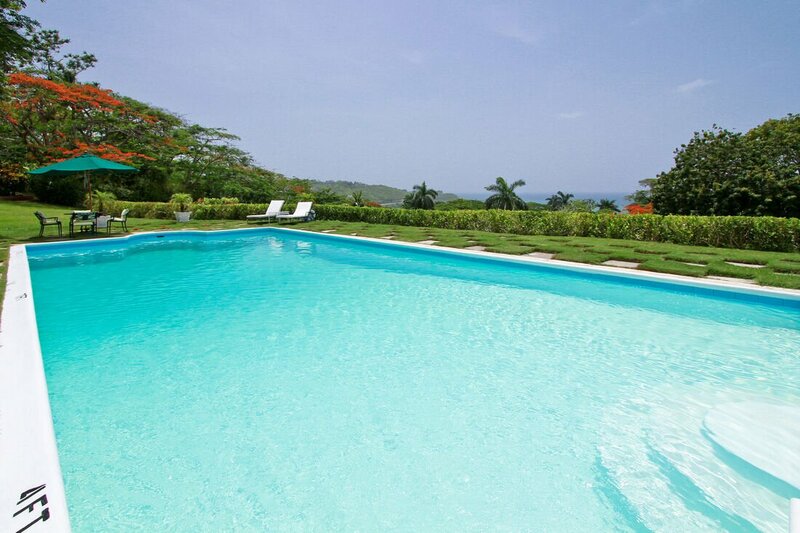 The swimming pool has a wonderful sunning deck that offers spectacular views. Tables and lounge chairs are also available making this area perfect for lunches or casual dinners, or for simply sitting and enjoying tropical drinks and watching the mesmerizing views. 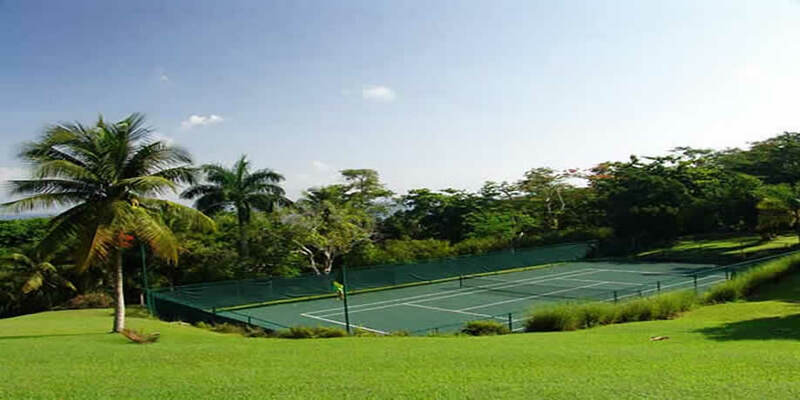 The Jamaica villa’s very own private new tennis court is of professional standards. 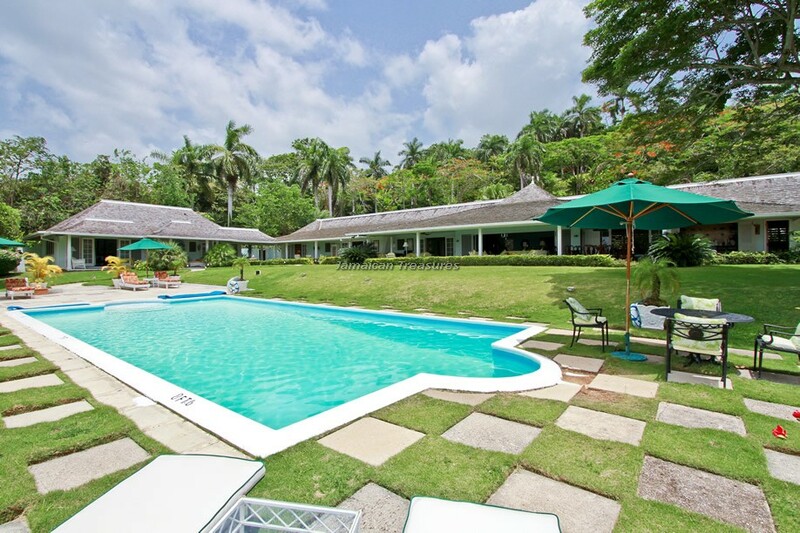 The gardens here have been well tended and offer the most beautiful tropical trees, including majestic palms, local breadfruit, mango, bananas and almond trees to name a few. The chef at Sea Island Villa often uses these fresh fruits from the land for a most enjoyable breakfast. 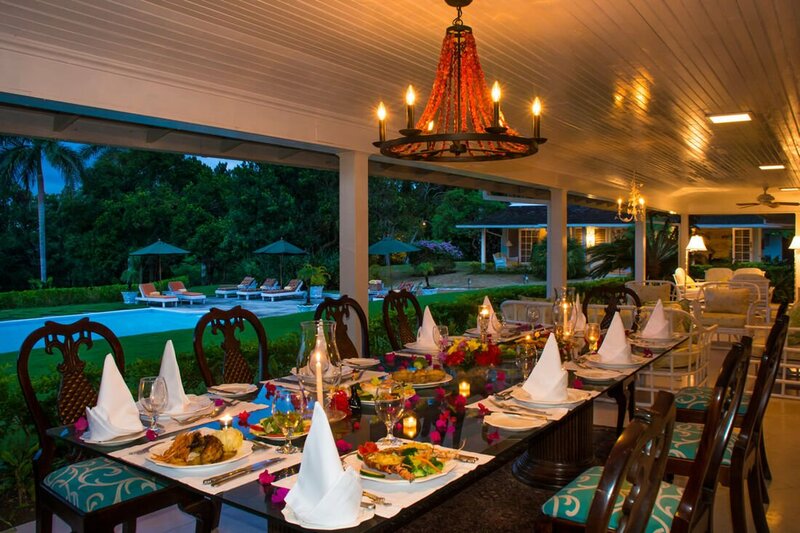 The newly renovated and state-of-the-art kitchen at Sea Island Villa is the place where the experienced cook prepares the most appetizing meals to be enjoyed at the elegant al fresco dining area. 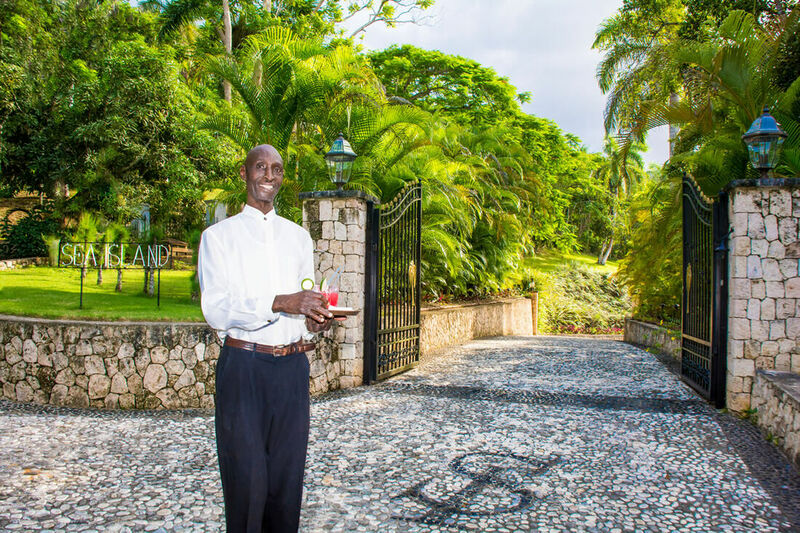 Sea Island Villa is fully staffed with some of the finest personnel on Jamaica's North Coast, who have been long serving and very loyal. 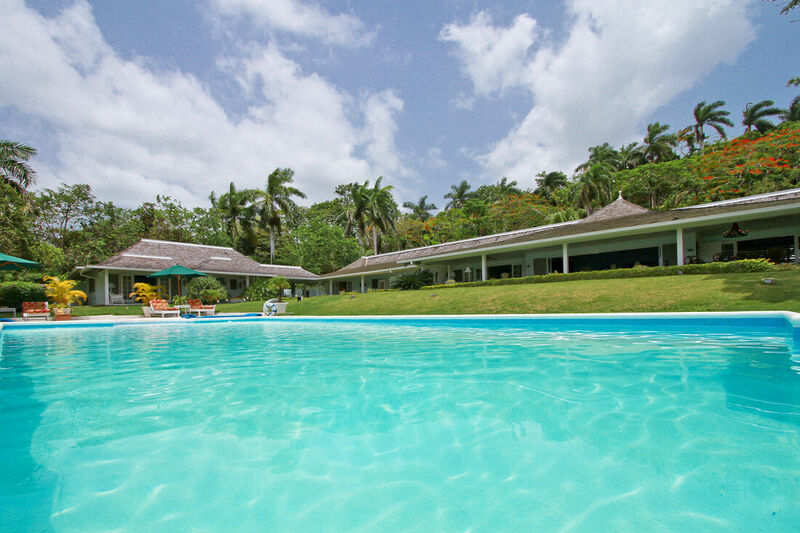 Their warm and loving care, complemented by highest standards of professional expertise makes this villa rental in Jamaica attract more repeat clients than any other villa in Jamaica. 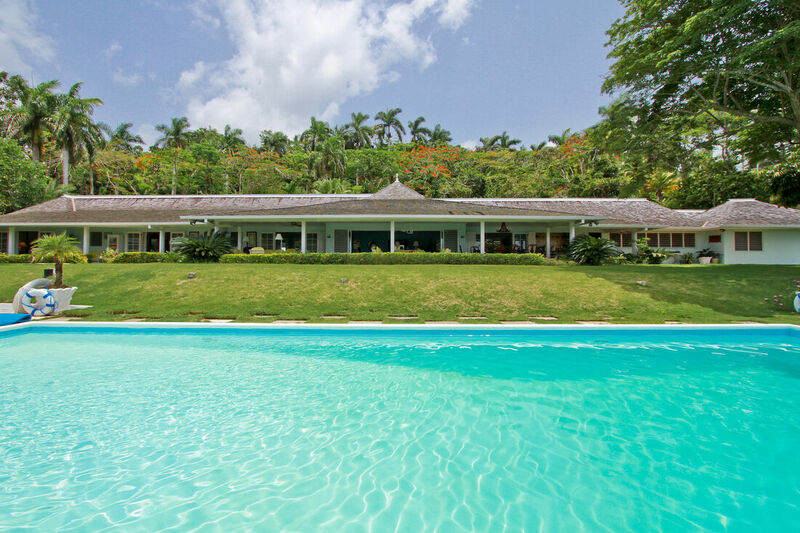 The magnificent Sea Island Villa is located within the Montego Bay area. 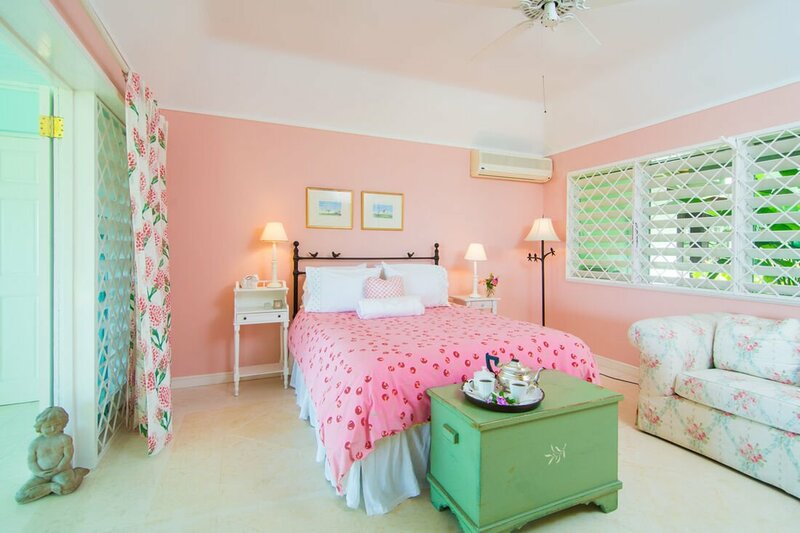 It is located a few minutes’ drive away from beaches, several world class golf courses and tennis facilities, restaurants, water sports and craft markets. 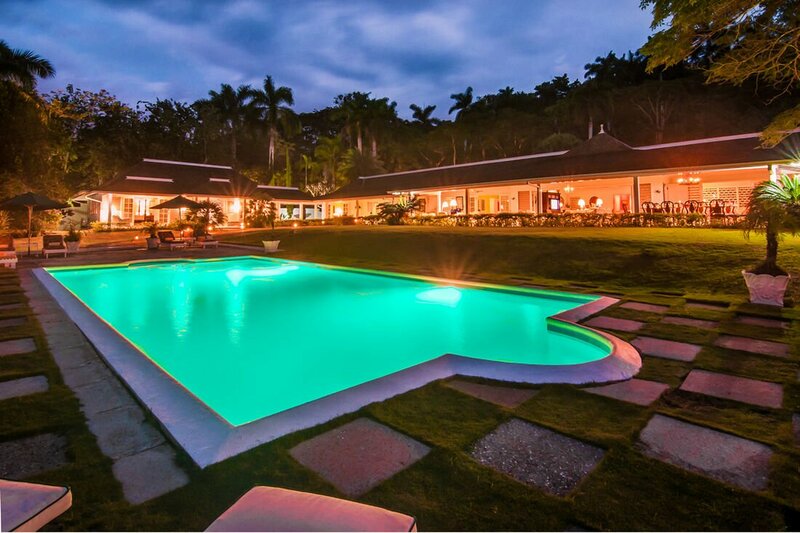 All guests can enjoy the first class resort facilities of the complimentary membership of yet another famous landmark, Round Hill which is only a short drive from Sea Island Villa. 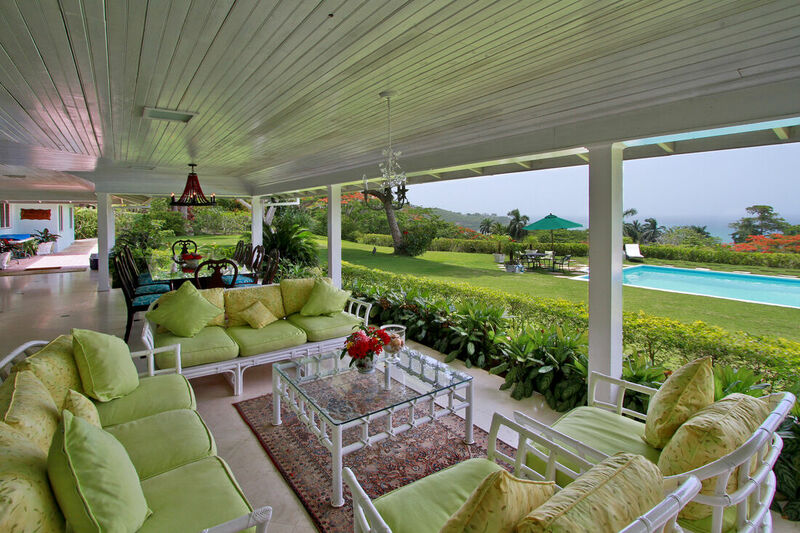 Lovely French doors to step out onto the marble tiled veranda to a cozy seating area. 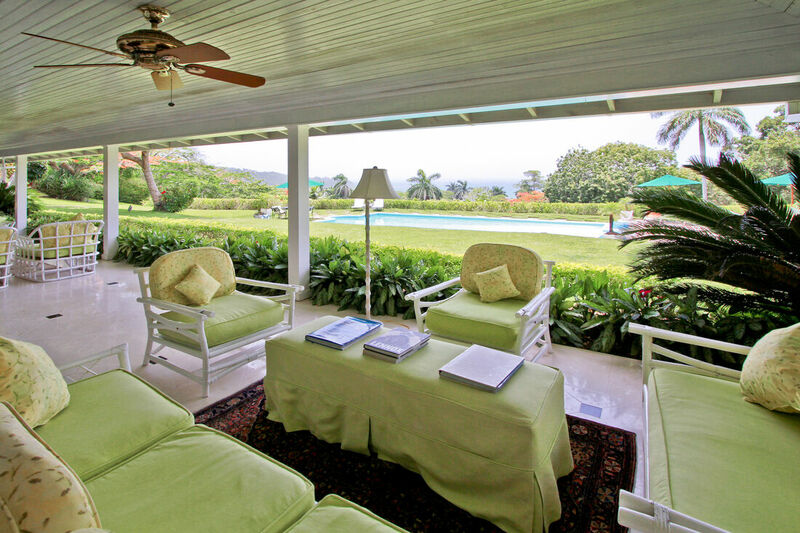 The perfect spot to enjoy your morning coffee or do some afternoon reading! 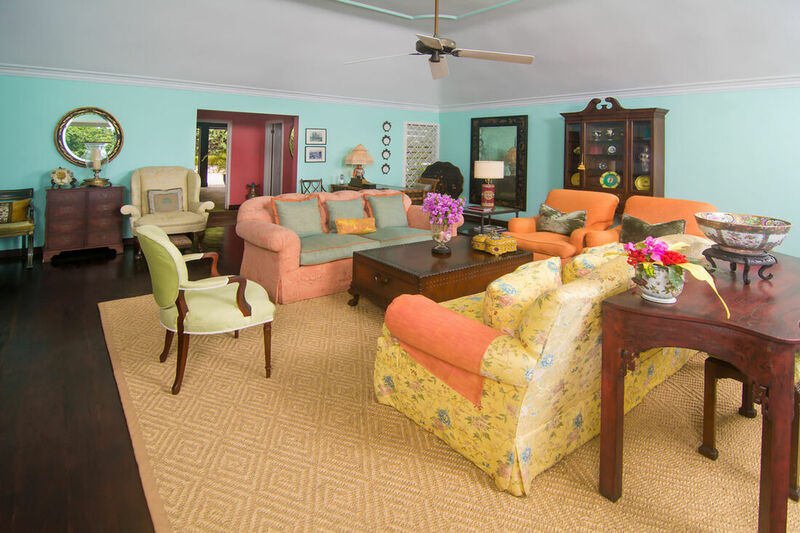 The elegant interiors of Sea Island feature a unique mixture of English Colonial, French and Jamaican furnishings accented by white limestone and rich mahogany floors. 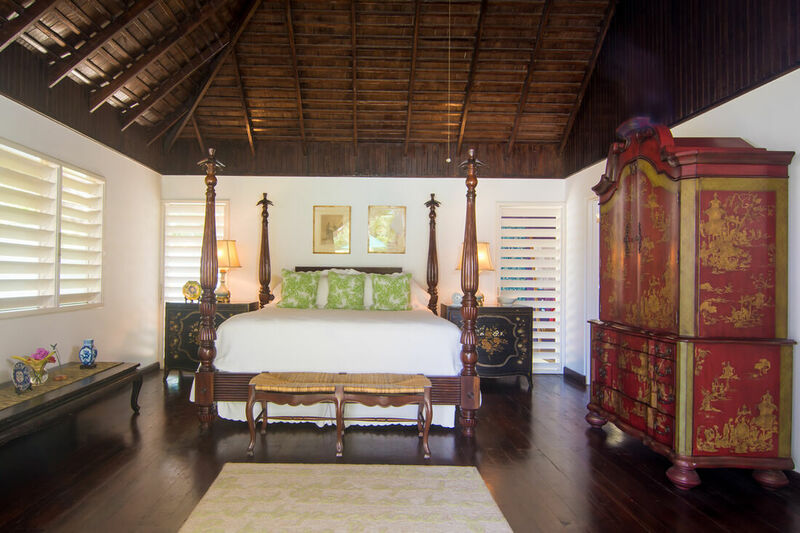 The rooms are enhanced by the arrangement of Bombay chests, Oriental and French linen rugs, and various antiques and art. 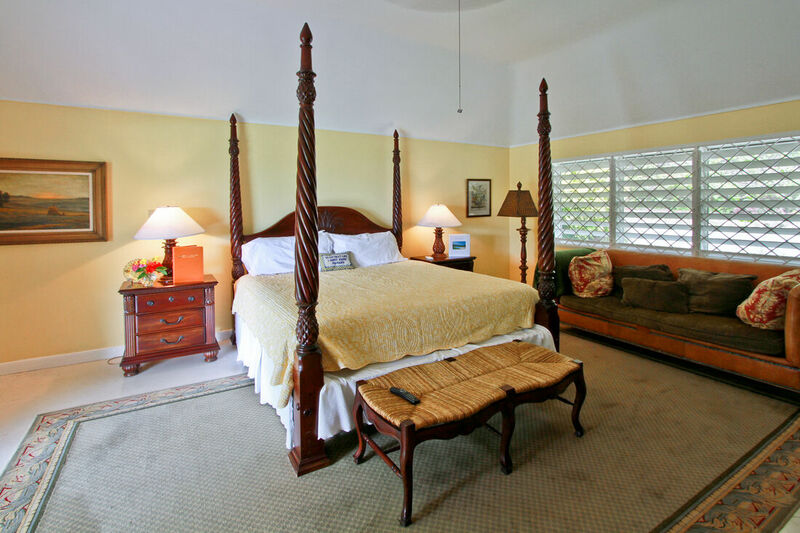 • Spacious, beautifully decorated two bedroom suite with wooden floors and tall ceilings. 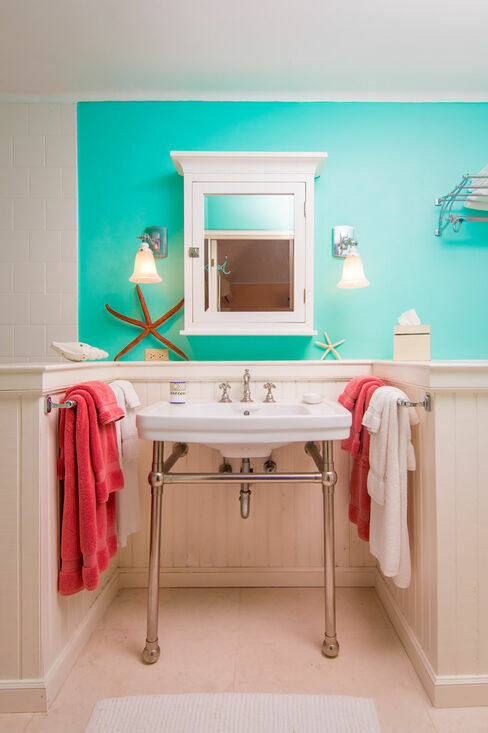 with colorful tiled shower areas that opens up to tropical gardens and outside showers. seating area. 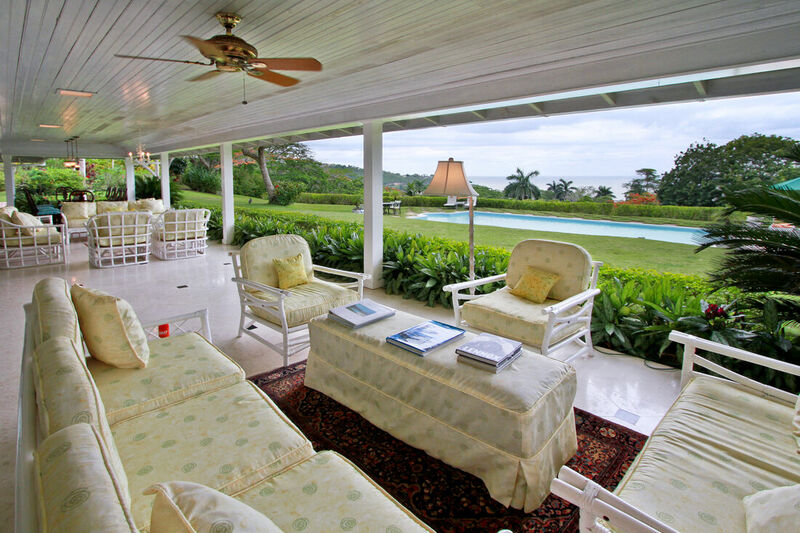 The perfect spot to enjoy your morning coffee or do some afternoon reading. 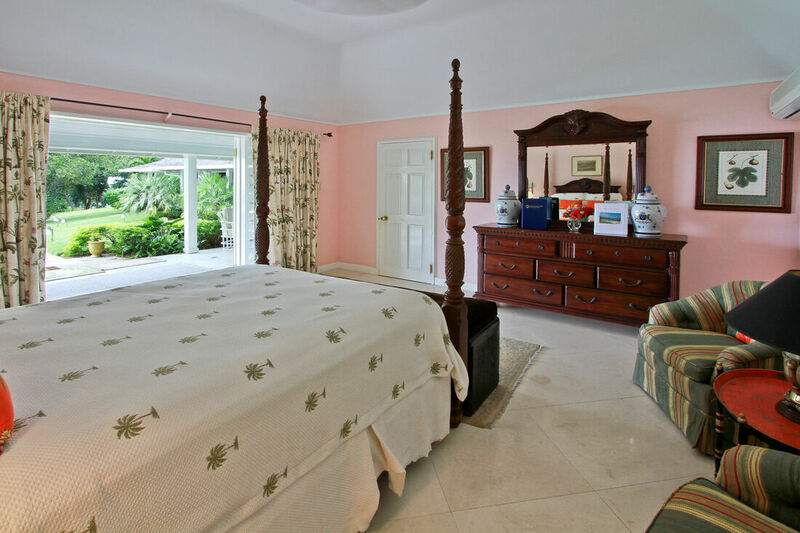 Silent Waters, Destiny Villa, Great River House, Spyglass Hill, Sea Island, Star Apple.